February 19, 2016 by David A. Have you ever driven a Ferrari full throttle down the Pacific Coast Highway? It’s an experience you’ll never forget. Especially with the Ferrari Spyder. Step into an alternate reality with this high-powered luxury car that’s highly regarded for a very good reason. Ferrari are one of the cars that are built for speed, elegance and for showing off on the highways. The name Ferrari itself states swiftness, charm and luxury. These cars are the status symbol for many people. The people who love high-speed driving are always attracted towards this car. The Ferrari has been in the automobile market for a long time and has never lost its ability to delight and stimulate people seeking the ultimate luxury sports car. Not having to maintain full-overage auto insurance is a huge benefit to most people. Under a rental agreement, the Ferrari is covered by rental insurance through the company that is renting the car. Any damage to the car or any kind of maintenance will be covered by the insurance. So, people can opt for the Ferrari experience without this costly overhead. Even if the car gets stolen, it will be still covered under the insurance policy of the car rental company. Every time the car is rented, it will be new and as clean as crystal to provide full enjoyment to the customer's experience. The experience of driving Ferrari is one of the amazing experiences in the lifetime of the people who cannot afford to purchase this car. 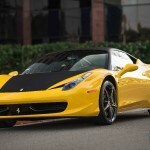 Many people opt for Ferrari rental as they cannot pay the price of the car. So, renting a Ferrari through the rental company provides a good experience to the people who desire to drive a big sports car that every person in the world wishes to have in their garage. Ferrari is one of the famous luxury sports cars. People choose Ferrari as a status symbol. It is an exotic car that fascinates each and every individual. Some people might use it to impress their colleagues. Getting the car from the Ferrari Car rental company also makes the customers stand out different from the rest of the crowd. It makes the owner of the car get noticed. This makes the people show off their status among their relatives and friends. In order to celebrate an occasion, people might use a Ferrari car rental service to feel stylish and unique in the celebration. It is one of the ways to feel elite and stylish. When an individual rents a Ferrari, it makes for a truly special occasion, and only they will know that it is a rental.